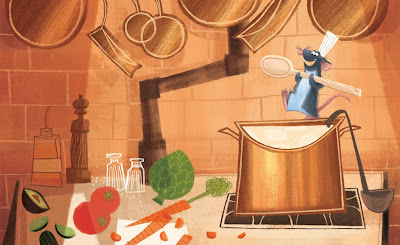 ★ LOOGAROO ★: RATATOUILLE | YES NO? I went and saw Ratatouille just this past weekend. In a theatre filled with kiddies, I think it was visually Pixar's best yet, however the wee kiddies got bored after about 30 minutes. Never the less it was a stunning display of animation, acting, special effects and well everything! My one gripe is story, did anyone notice a subtraction of substantial character arcs in this one? Joe Ranft would have caught this stuff me thinks.